A drawing by Josef Hoffmann is the basis for this vase. The feet of the vase are made of rose quartz balls. The plastic effect of the surface is achieved with soldered silver wire. The companion piece to the bulgy vase originates from the same shop in Italy. This fact, and some stylistic similarities (like the narrow neck and the wide flat spout) leads us to the conclusion, that both vases were probably designed by the same person. We found and bought the model of this vase in a furniture shop in northern Italy, where it had been since the 1950s, without being sold. Neither any stamps on the vase, nor any information from the owner of the shop, give any indication as to the designer or former producer of the vase. As it is a beautiful, distinct form from the early 1950s, we find it worth while to produce the vase, probably for the first time in a series. = This vase has been reconstructed after an original drawing. We have found no indications of this piece in the existing Hoffmann literature, and therefore believe the vase is now produced for the first time. The lines are engraved on the surface and blackened. We succeeded in obtaining the original drawing from 1927 of this vase, now produced for the first time. The rather high vase, in the shape of a trumpet or tulip, stands on a reddish gold plated inter-socket, which is attached to a black marble base. Known as a painter and graphic artist, Fritz Uphoff from Worpswede, designed during the twenties, a series of objects, which were produced by August Haarstick. For the purposes of reproduction, we had an original cup at our disposal. These goblets are illustrated in several editions of Art Deco literature. Through the asymetric shift between the upper part of the goblet and the foot, the purely functional form is given a decorative character. More is known about Desny�s work than his personal life. What is known is that during the 1920�s and 1930�s he had a shop in Paris where he sold lamps and tableware of a very special stylistic character. The question of the copyright or of who the designer was is not always clear, as the label from Desny�s shop did not necessarily mean that he designed the article he sold. The rectangular tobacco box and the lid are made of sterling silver, the cylindrical shaped handle on the lid is gold plated. The attribution, made in �Bruckmanns Silverlexikon� is fairly questionable. The stamps on the bottom and on the socket 0835 PV and 3* only state the silver content. They give no evidence of Bauhaus, nor of the supposed designer Marianne Brandt. Some of the stylistic characteristics are also atypical for Brandt, such as the straight metal handle of or the oblique socket. One more point, which speaks against the attribution is the fact, that cocktail shakers, produced in the workshop of Bauhaus are unknown. The workshop produced tea sets, bowls, lamps etc., not pretentious luxury objects like cocktail shakers of silver. The basic form of the shaker corresponds to the idea of Bauhaus and also strictly with the function. Is there a more ideal form that the globe in which to mix or toss a drink with circular movements? The formal conception of this object is very convincing, even without any attributions to a designer. The shaker was designed around 1925. The original bucket, designed around 1930, comes from the London Casino. The simple, powerful form and the massive handles give the object its formal beauty, and makes it at the same time practical to use. This two-purpose ashtray was designed in Germany circa 1930. It can be converted from a table ashtray on feet made of three metal balls, to a floor ashtray, standing on three tubular legs (delivered with the item which can be screwed on between the ashtray and the feet). In the metal semi sphere there is a glass bowl for the ashes, on the lid are attached holders for the cigarettes and matches. From the original, which is in our possession, we have only been able to identify the producer G.A.B. (Guldsmedsaktiebolaget), in Stockholm. The single piece of information about the designer, Folke Arstrom, we found in the book �Svenskt Silver�. 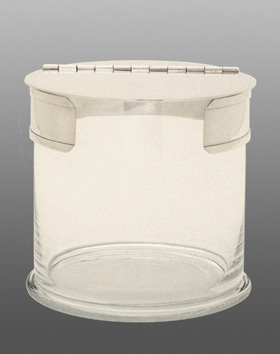 The shaker is completely worked in silver, the top, as that of the original is made of turned hard synthetic material. Year of design: 1937. In 1924 Marianne Brandt designed a variation on the Bauhaus ashtray. Instead of the strict geometric opening it has a round one with a cigarette holder attached to it, which makes it more practical to use. The removable top is in silver, the base is 18 carat gold plated. The original of this ashtray is part of the collection of the Bauhaus Museum in Dessau. The original of this silver champagne cooler comes from Germany, circa 1930. The designer is unknown. The sweeping, elegant form is nostalgic of the atmosphere of the excessive, riotous parties, held in the late twenties and early thirties. This set was designed for the Cunard Steamship Co. Ltd. in the beginning of the 1930s. The company later amalgamated with the White Star Line, forming together the Cunard White Star Line, which had the most renowned English passenger ships under its flag. The set was made in silver plate for the 1st class and in china for the 2nd and 3rd classes. Although the idea of cube shaped tableware was not quite new (compared with the famous refrigerator set from Wilhelm Wagenfeld, for example) the use of it on ships is ideal, saving storage space and room on the tables and trays. Today we see this idea in use for example on airplanes, but unfortunately, the quality of the design is poor, compared with the �Cunard� models. With the help of some photos and additional information from the widow of Hans Przyrembel, we have reconstructed this simple and practical tea glass holder. The glass inset (a commercial tea glass, still produced by the Jenaer Glas) is held by silver wires and an ebony holder � the ebony holder to prevent the heat of the liquid to spread. This tea globe is produced from T�mpel�s original drawing. It consists of two semi globes. The ball contains enough tea for one glass, so everyone can brew his or her tea according to individual taste and preference. The handle is turned hard synthetic material. One of the main tasks of the Bauhaus work shop was to design and produce utensils for the preparation of tea. During the years 1923-25 each member of the metal work shop contributed at least one object to this product range. We have chosen to reproduce the tea globe holder from Wilhelm Wagenfeld. Produced in series for the first time. The striking handle of the teapot is the main characteristic of the tea set. The original handle was made of ivory, however the same effect has been achieved with a lacquered wooden handle. The reconstruction was made on the basis of several old photographs. Obviously under the artistic influence of Marianne Brandt, but nevertheless adding his own design, Hans Przyrembel created this cream/sugar set in 1925. The set consists of a creamer and a sugar bowl. This teapot is part of the tea and coffee set, designed in 1924. Only one complete set is known to exist. The teapot, on the other hand, is in several museums, includung the Museum of Modern Art, New York. They were very obliging in giving us a technical drawing, from which our reproduction was manufactured. The teapot is the part of the set, which most strictly follows the formal principles of the Bauhaus school. Circle, globe and square are the basic forms of the construction. This Mocca set was designed for the Guldmedsaktiebolaget in the 1920s. The set, which can also be used for tea, was produced in a silver plated version, probably in several copies. The distinct form and the consideration for the function (e.g. the handles, which are very comfortable to grip) show the master class of this piece of work. The design of this extraordinary set is attributed to the Frenchman Boris Lacroix, nevertheless we could not be certain, neither from the stamps on the original pieces, nor in any literature known to us. Until now, Lacroix is only known as a designer of lamps. The set consists of 2 large pots (for coffee, tea or hot water) one cream pot, one sugar bowl and the tray. The parts, put together, form a quarter circle. All the lines, seen from above, end up in the middle of the circle. The tray, separate of the set, forms with it a complete semi circle. A silver profile rim holds the blue glass plate. The tray was designed in Germany around 1930, the designer is unknown to us. The combination of the silver rim and the dark blue glass plate gives this tray a cool and noble look. Thanks to a counterweight on the inside, the lid of this jug opens automatically, when pouring the wine. Sylvia Stave designed several silver objects for the "Guldsmedsaktiebolaget" in Stockholm. Almost nothing is known about her personally, although she was one of the leading designers in Scandinavia during the 1920s, her design work being equal to the outstanding quality of Marianne Brandt in Germany. Wilhelm Schulze created this candelabra in 1926/27, and is now produced as an exact replica, using the original drawings and models as reference. Wilhelm Schulze was born in Norway and learned his craft in Oslo, before settling in Germany. The powerful but clear lines of his work were certainly influenced by the impressions gained during the early years in the North. This almost classicist candle holder is produced from a model. The designer is Wilhelm Schulze, who remained regrettably unknown till now. This candle holder stands formally between classicism and the Swedish Funkis-Style of the 1920s. Similar candle sticks were designed by several Scandinavian designers, amongst others Sigvard Bernadotte and Nils Fougstedt. The designer of this particular candle stick is unknown to us. Matching the vase, we also produce a set of candle sticks. The original form has not been altered, the proportions simply diminished in relation. For this reason, the candle holder and the base are to be loosely fitted to the main part. On the other hand, the two additional loose parts are essential for the stability and the function. The body and the base of the candle stick are made of silver, the feet of rose quartz balls and the candle holder of brass, silver plated. The Bremen gold and silversmith, August Haarstick, created several knife rests around 1930. The form of this practical table utensil which we have chosen for our collection (for the first time produced in a series) is quite simple and functional. As a basis for our reproduction we had a model and the original design drawing. The earlier version of the bowl, made of German Silver (alpacca) has been taken out of our collection; only this edition, limited to 100 pieces and made in sterling silver, will be produced. 1929 Marianne Brandt designed a whole set of plates in different sizes, made of chromed brass. We have decided to reproduce the largest of them in silver. We had the original plate, which was used to make the form. The bottom is lightly curved inwards, which gives the plate stability and the material a certain tension at the same time. Hans Przyrembel used the same idea for the handle of this pastry slice as he had for the tea glass holders. The slice, designed in 1925, is very handy for serving smaller pastries and biscuits. One more utensil for the tea ceremony. As a basis for our remake, we had two slightly different models. Wilhelm Wagenfeld designed several versions of this very practical table utensil. The first type, from 1923, was Wagenfeld�s project to qualify as a journeyman. It had a rounded form and a glass lid. The third version from 1927/29 had an elegant saucer and ebony handles. The second version, which we have chosen for our remake, is from the early Bauhaus period. It has clear lines and simple forms, which serve and accentuate the function. The gravy pot is constructed so, that you can pour the fat gravy through the short, upper spout and the meagre gravy, which is heavier, through the longer spout opening at the very bottom of the pot. The inside of the gravy pot is gold plated, to prevent the silver affecting the taste of the gravy. We found the original in the consulting rooms of a physician, whose practice had been equipped and decorated in the twenties. The designer, as well as the former producer, are unknown to us. The box is ideal to keep cakes, chocolates, snacks etc. We find the simplicity and the function of the box absolutely brilliant. This cake box, created about 1927 by Fritz Uphoff, is one of the few outstanding Art-Deco objects from Germany. The effect of the hammered surface is emphasized by the pointed angles and the channels radiating from the top. Josef Albers created this fruit bowl in 1924 with two slightly different variations; the difference being the size of the wooden balls, which serve at the same time as feet and as holders of the glass plate. The one with the larger feet is produced in silver, in an edition limited to 100 pcs. The original is in the collection of The Museum of Modern Art, New York. The original egg cup was an early design in bakelite, made to facilitate production using synthetic materials. The design dates circa 1930, but the designer is unknown to us. The model, which we have, was no doubt cast, so it posed no problems to make a mould for our reproductions of sterling silver. Four discs make the feet of this wide tulip-shaped bowl. This object is one of the few interesting examples of Art Deco silver ware, designed in Germany during the 1930s. Originally, the box was designed in pewter, but the lasting quality of the 78 year old design shows also in our remake in sterling silver. A simple, but fine detail is the circular flutes on the lid, giving the box its lightness.